One of my primary motivations for making articles and other items from vintage editions of American Modeler and American Aircraft Modeler magazines available online is so that people who were involved in aeromodeling decades ago might perchance do a search and happily find either themselves, a friend, or a relative mentioned. Since starting AirplanesAndRockets.com a couple years ago, a few people have written to thank me for the effort. I'm glad to do it. I also respond to requests to scan and post any article if I happen to have the necessary copy of the magazine. 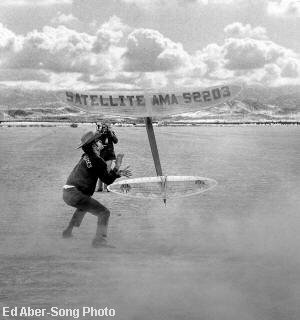 By far the coolest contact I have had so far was this one just received from Ed Aber-Song, who, while reading the article on Bill Hunter's Satellite 1000 free flight model in the May 1972 edition of AAM, was surprised to see himself in the background of the Cover Photo! It was from the November 1971 free flight championships in Taft, California. 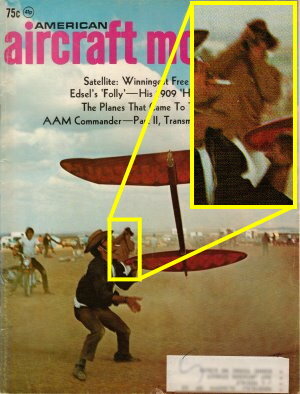 Says Ed, "I was browsing your excellent website and while looking at the Bob and Bill Hunter Satellite plans, noticed that I am in the Cover Photo of the May 1972 American Aircraft Modeler magazine. I was taking a photo of Bill Hunter at exactly the same moment as the photographer who shot the Cover Photo. I'm wearing the funky hat standing on the other side as Bill launched his airplane. I had no idea I was in the Cover Photo! The photo I shot at the exact same moment is attached. How strange that these two photos came together so many years later." 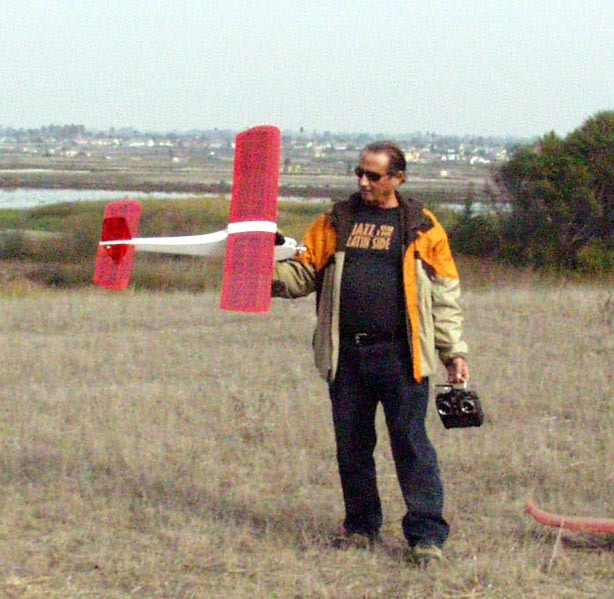 Upon requesting permission to post his photo and story, Ed responded, "Yes, please feel free to post the image on your website along with my name, Ed Aber (AMA 179), member of Cloud Dusters Model Airplane Club. At the time I was flying competition free flight and friends with Bob and Billy Hunter of the San Valeers Model Airplane Club in SoCal. Later the same year I set a C Gas National Record and shortly afterward embarked upon a career as a professional photographer and journalist." Did you notice AMA 179?!!! 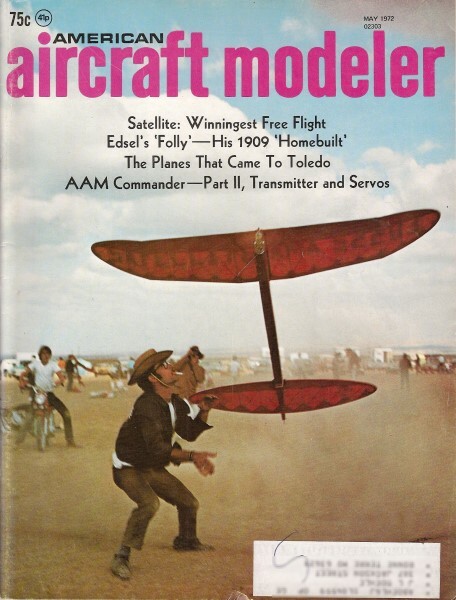 Here is the Cover Photo from the May 1972 American Aircraft Modeler. Ed Aber is the guy in the background taking the picture from the other side of Bill Hunter's Satellite 1000. The photographer for this Cover Photo was either Paul or Mary Ortman. 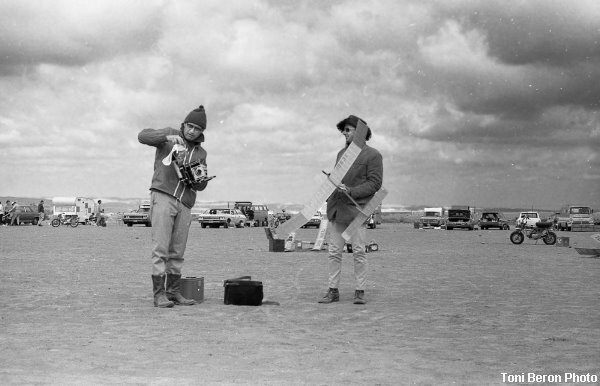 At virtually the same moment in time, here is Ed's photo of Bill Hunter and his Satellite 1000, showing the AAM cover photographer in the background. More from Ed: "Here's photo of the cover photographer at the contest taking a photo of me." This is Ed (on right) with his model, as taken by photographer Toni Beron. Many thanks to Ed for making this gem of a coincidence available. "Hi Kirt: My name is Mike Schwartz and I flew with Bob and Bill Bunter beginning in 1958. I am in the process of writing the history of the Satellite design for the 2013 NFFS Symposium. There are some statements made concerning the May 72 Satellite 1000 article and the cover shot that need clarification. The plane on the cover that Bill is flying is in fact a Satellite 1300 powered by a ST. 65. Because of the Satellite 1000 article and plans everyone all these years have assumed the cover airplane to be the 1000 size. In 1970 when the series 70 satellite was designed , the first 3 built were in fact 1300's powered by ST.65 engines. Bob, Bill and I built the first 3 which are the only ones that had the planked wing and stab leading edges. If you look at the cover shot you can see the planked leading edges. As a matter of interest all 3 1300's were built in 7 straight days of building from cutting out all the parts to the final assembly and ready to fly. All of this work could only be done thru the use of " hot stuff" glue. The location of the shot was not Taft but a flying site just off Basic School Road which is approximately 6 miles from the current Taft flying site. We used to fly at Gardner Field which is at the end of Basic School Road just as you turn left to head towards Taft. Gardner Field was a World War 2 basic training field for the Army Air Forces. All the buildings had been removed but the foundations remained which were a hazard to the models. In 1970 all the local clubs got together to start a contest that became the F.F. champs. A new site was found that was on the west side of Basic School Road just south of the California aqueduct before you got to Gardner Field and the first 2 FF champs were held there. In 1972 the FF champs moved to the current Taft site. If you Google Taft, California on their map site you can see the area in question. We would take I-5 north from L.A. and drive to the Maricopa Highway (166) exit and head west until we reached Basic School Road, where you turned right to head towards the flying site. If you wanted to go to Taft you would make a left on Cadet Road where Basic School Road ended and head east to Gardner Field Road where you turned right to Taft. As you can see all the roads in that area were named related to Gardner Field. Ed Aber's photo of Bill launching his plane was taken towards the south with Maricopa Highway in the far background. Likewise the AAM photographer was looking north. If you look at the terrain in the May 72 issue you can then compare the terrain in the April 73 issue in The Giants of Free Flight [Mike is in that article, KRB] article in which the photos were taken at Taft and then you can see the difference. Concerning the satellite 1000 plans, the original plans were drawn on vellum paper and then 3 copies were printed. 1 copy was cut up to make the templates needed and the rest of that plan was used by Bob and Bill to make the 2 prototypes. Bob retained 1 copy for his records and I got the 3rd. I still have my original copy. The vellum original was then revised for the May 72 satellite article and plans. I also have a copy of that plan. The vellum original was revised a 2nd time for the Satellite City Pro kit plans. I also have that plan. In 1957 when the first Satellite was designed the first one built was a 1300 also. This was followed by 3 of the 800 size models. I have one of the 800's which is the oldest existing Satellite. If you want to read the rest of the Satellite history you will have to get a copy of the 2013 NFFS Symposium. If you have any questions please e-mail me. "Kirt: I need to add one item to my list of 1957 Satellite designs. When I e-mailed you about the various Satellite sizes I was thinking about the ones of which actual plans were drawn. I forgot that in 1959 Bill Hunter built a 1000 sq. in. size. He built the plane using the 800 size plan which he used to build it around the outside of the drawings. This was a one-off size which was built to compete at the 59 Nats where he won the Jr. National Championship. It was built because of the new heavy weight rules that were in effect then. The plane had a Johnson .29 for class B. The plane had a fiberglass fishing pole blank for a fuselage with a 1/2" plywood pylon to bring it up to the weight rule. In my NFFS Symposium article I am going to write about the use and history of this method of fuselage construction. This plane and all the other early Satellites that Bob and Bill had were lost on the way to the 60 Nats when the top came off the roof top carrier at 65 mph just outside Blythe, California. The wings and stabs flew out and were destroyed when following trucks ran over them.